On 2nd April 11 members of the botany group met to carry out this year’s translocation. Our first job, however, was to assist one of the group whose car was precariously balanced over a large ravine in the farm track at the turning place. With the aid of a large branch wedged in the gully and much muscle power, we managed to get the vehicle back on the track. This year’s planting was on the other side of the valley, on sites agreed with the landowner, tenant and statutory bodies. 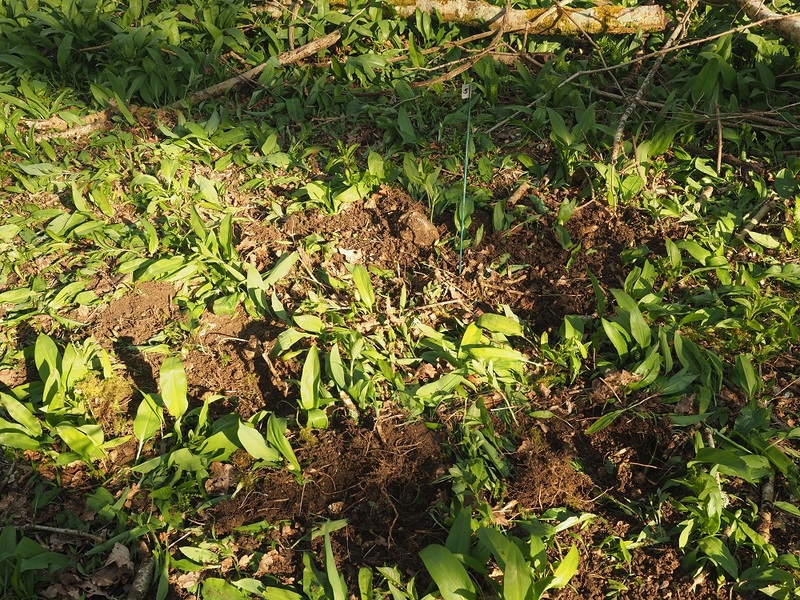 Thirty plants were set out in groups in a woodland glade and a further thirty on a slope cleared of scrub in recent years. The soil was moist, quite rocky in places and required the removal of some vegetation before the plugs could be set out. To assist re-finding the plants, a numbered stake was placed in the middle of each group. Photographs and GPS readings were also taken. At the end of the morning, we finished with coffee and appropriately, ‘rocky road’ fridge cake, with an arrangement to reconvene in the second half of August to monitor the establishment and flowering of the plants.